Published in the Journal of Foot and Ankle Research, this guideline contains 10 key recommendations to guide health professionals in selecting the most appropriate footwear to meet the specific foot risk needs of an individual with diabetes. Diabetes-related foot disease is defined as ulceration, infection, ischaemia or neuro-arthropathy of the foot in people with diabetes. People at-risk of diabetes-related foot disease are defined as those with diabetes who have developed peripheral neuropathy, peripheral arterial disease or have a history of previous foot disease. Diabetes-related foot disease (DFD) is globally-recognised as the leading cause of diabetes-related hospitalisations and amputation, with mortality rates comparable to many cancers. It poses a major burden on an individual’s quality of life, significant risks to their morbidity and mortality, and increases their healthcare costs. Foot problems in diabetes are among the most serious complications of diabetes mellitus. Foot problems are a source of major suffering and costs for the patient, and they also place a considerable financial burden on healthcare and society in general. Foot care in practice needs a strategy that includes prevention, patient and staff education, multi-disciplinary treatment of foot ulcers, and close monitoring of people’s feet. Such practice may prevent diabetic foot ulcers and their sequelae like amputation or prolonged hospitalization. Diabetic foot ulcers frequently result from a patient simultaneously having two or more risk factors, with diabetic peripheral neuropathy playing a central role. This neuropathy leads to an insensitive and sometimes deformed foot, often causing an abnormal walking pattern. In people with neuropathy, minor trauma (e.g., from ill- fitting shoes, walking barefoot or an acute injury) can precipitate ulceration of the foot. Loss of sensation, foot deformities, and limited joint mobility can result in abnormal biomechanical loading of the foot. This produces high pressure in some areas, to which the body responds with thickened skin (callus). This leads to a further increase of the abnormal loading, often with subcutaneous haemorrhage and eventually ulceration. Whatever the primary cause, if the patient continues walking on the insensitive foot it impairs wound healing. Foot ulcers will heal in the majority of patients if the clinician bases treatment on the principles outlined below. However, even optimum wound care cannot compensate for continuing trauma to the wound bed, or for inadequately treated ischemia or infection. Patients with an ulcer deeper than the subcutaneous tissues often require intensive treatment, and, depending on their social situation, local resources and infrastructure, they may need to be hospitalised. There are seven key elements that underpin treatment of diabetic foot ulcers, whereby it is needed for these elements to be delivered by a multidisciplinary foot care team. Published in the Journal of Foot and Ankle Research, this guideline contains 10 key recommendations to guide health professionals in selecting the most appropriate footwear to meet the specific foot risk needs of an individual with diabetes. This new footwear guideline updates the 2013 Australian practical guideline on the provision of footwear for people with diabetes. This includes having adequate length, width, and depth (and consequently adequate girth, i.e. adequate volume). A particular emphasis may need to be placed on the toe box of the shoe that should be consistent with the shape of the forefoot and toes of the person. An enclosed heel with a stabilising heel counter is recommended. Openheel footwear can result in direct trauma injury to the heel and may require a person to claw their toes in order to keep the footwear fixed to their feet, further increasing the repetitive stress under their forefoot, and in turn the risk of ulceration. 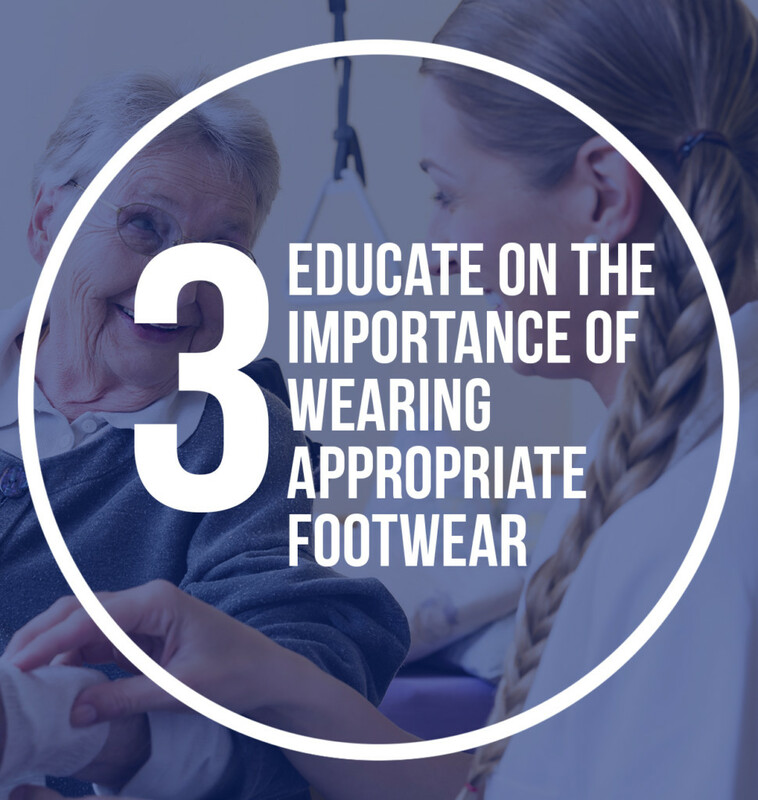 People with diabetes, their relatives and caregivers should also be educated on the importance of appropriate footwear to prevent foot ulceration, and the importance of adherence to wearing it. Also, the importance of annual foot screens to assess their risk of foot ulceration, and to return for further footwear advice if their foot risk status increases should be emphasised. Due to the complexities in accommodating the foot and the importance of preventing foot ulceration, people with diabetes should be instructed to obtain their footwear from an appropriately trained professional with demonstrated competencies in footwear fitting for this population, to ensure the footwear meets all requirements. People who develop diabetic peripheral neuropathy lose protective sensation and their ability to feel pressure and pain. Thus, they may have a tendency to purchase poorly fitting footwear in an attempt to stimulate some sensory feedback. They also do not feel abnormally high repetitive stress (pressure or shear) caused by inappropriate footwear or walking barefoot and are more likely to develop pre-ulcerative lesions (e.g. callus or blisters) that subsequently lead to ulceration. 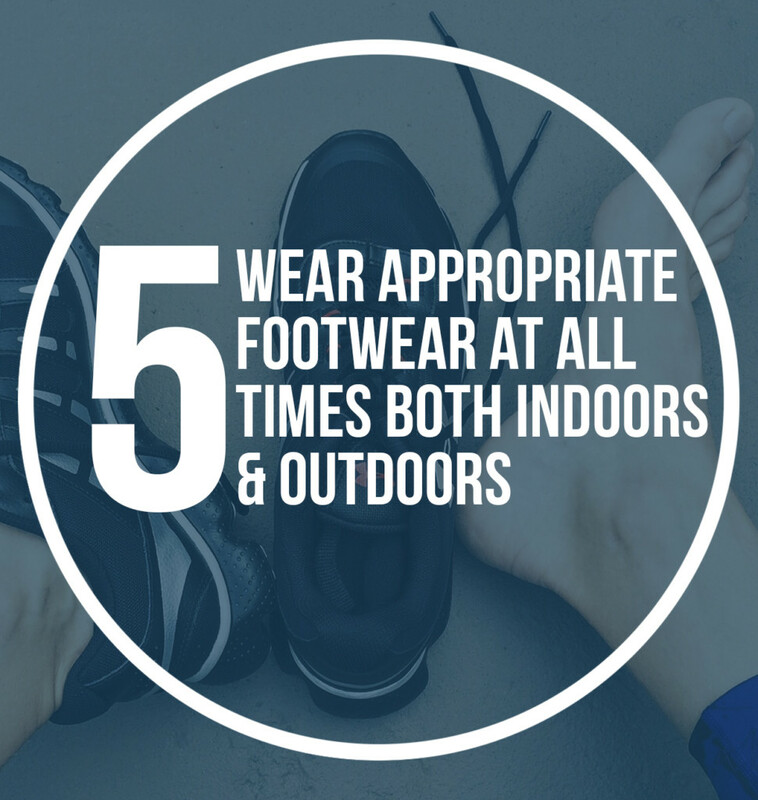 Because of their increased risk, people with diabetes at intermediate- or high-risk of foot ulceration should be motivated to wear their footwear at all times, both indoors and outdoors. 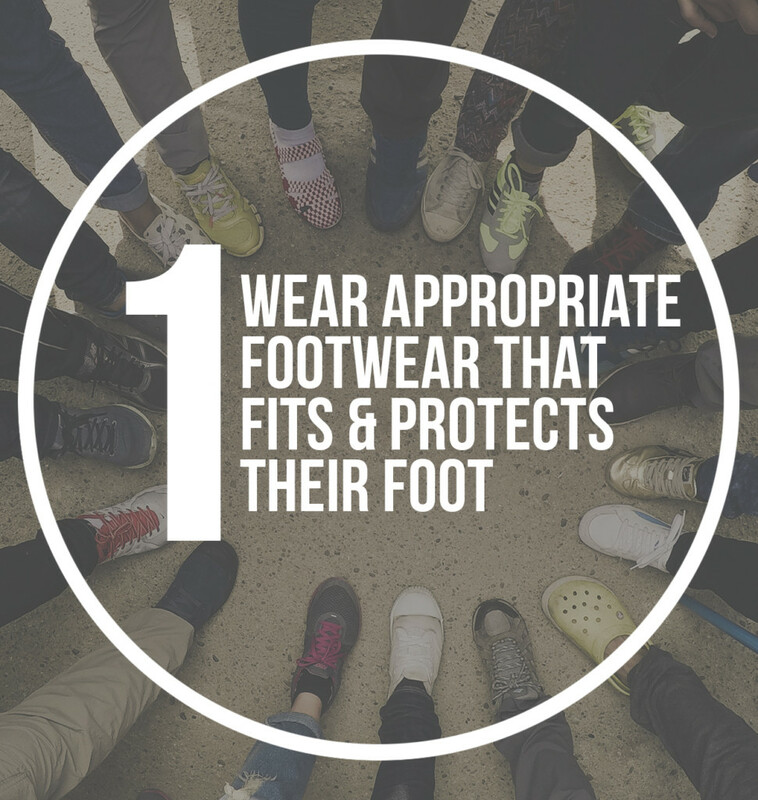 The indoor footwear should meet the same requirements with regard to adequacy of fit and offloading, but compromises might be made in the materials used in manufacture, as it is likely to experience less “wear-and-tear” compared to footwear used outdoors. People with peripheral neuropathy have lost the ability to feel pressure, pain or foreign objects. 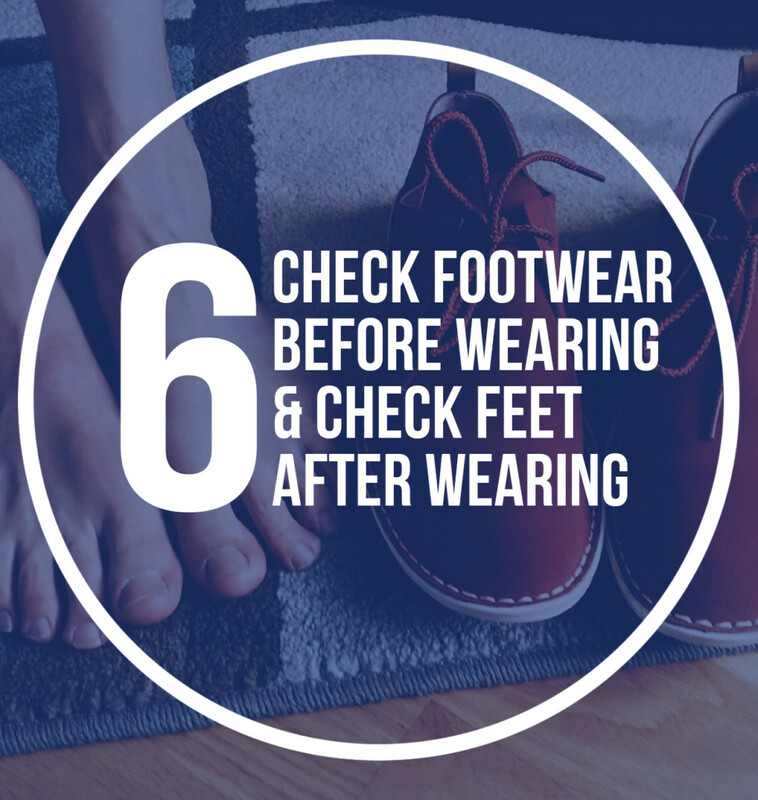 They, or their relatives and caregivers, need to be motivated to check their footwear each time before they are put on, to ensure that there are no foreign objects in the footwear or penetrating the soles. 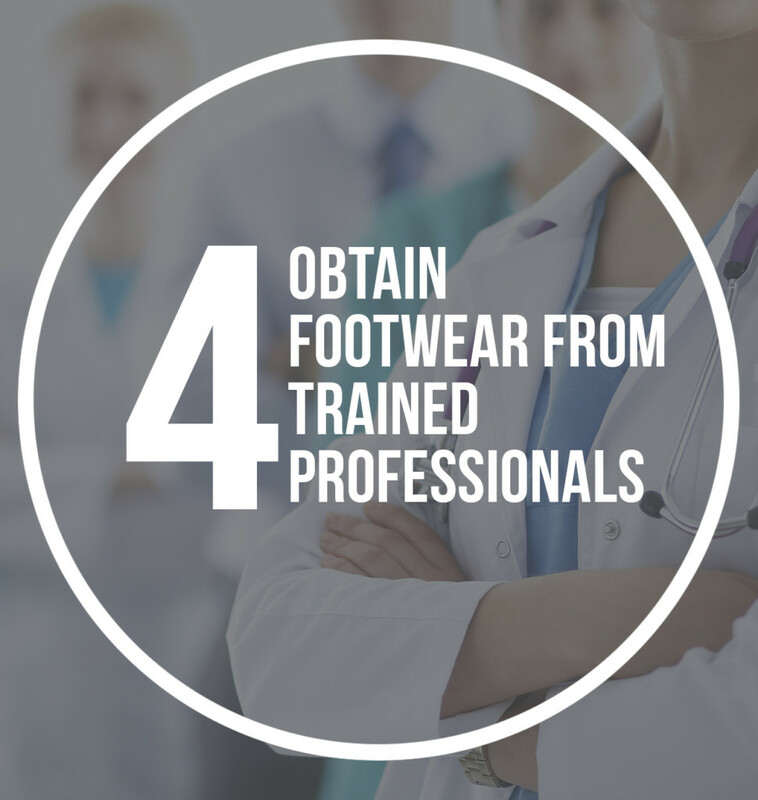 Furthermore, they should also check their feet each time their footwear is removed, to ensure that there are no signs of abnormal pressure, shear, trauma or ulceration. 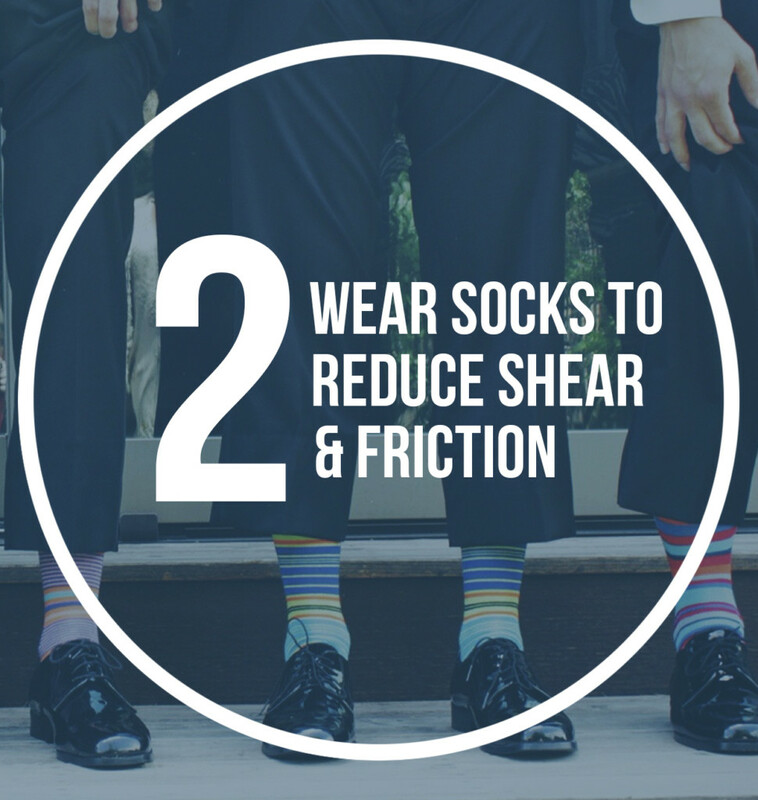 When a foot deformity, pre-ulcerative lesion is present, off-the-shelf footwear is not likely to be appropriate. 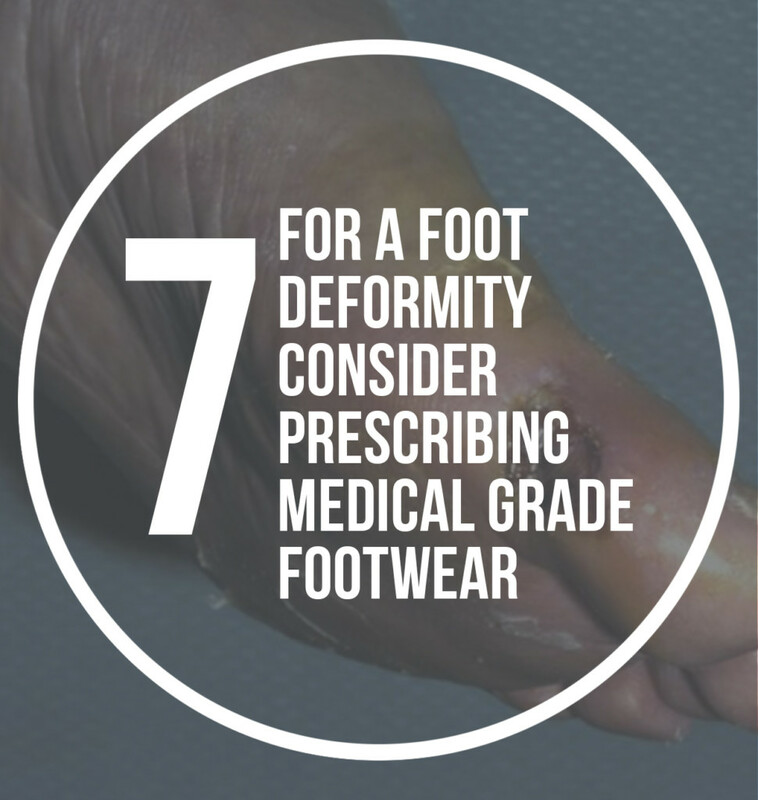 Prescribing medical grade footwear (pre-fabricated or custom-made needs to be considered, to accommodate the altered biomechanics. For people with a healed plantar foot ulcer, off-the-shelf footwear is most unlikely to be sufficient. 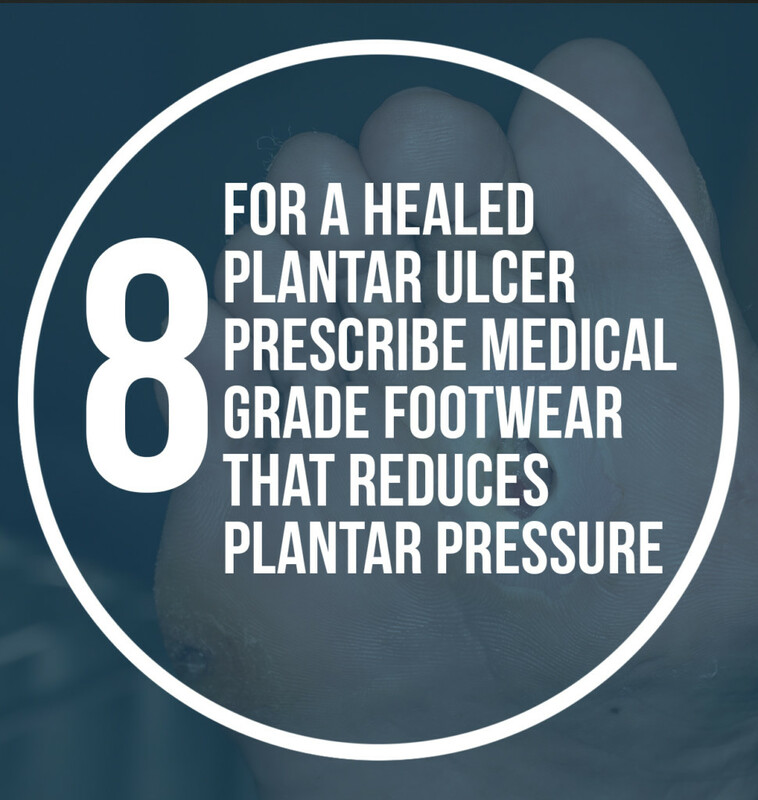 Medical grade footwear (pre-fabricated or custom-made) with a demonstrated plantar pressure reducing effect at high-risk areas, including the previous ulcer location, needs to be prescribed. Both the foot and the footwear change shape over time. 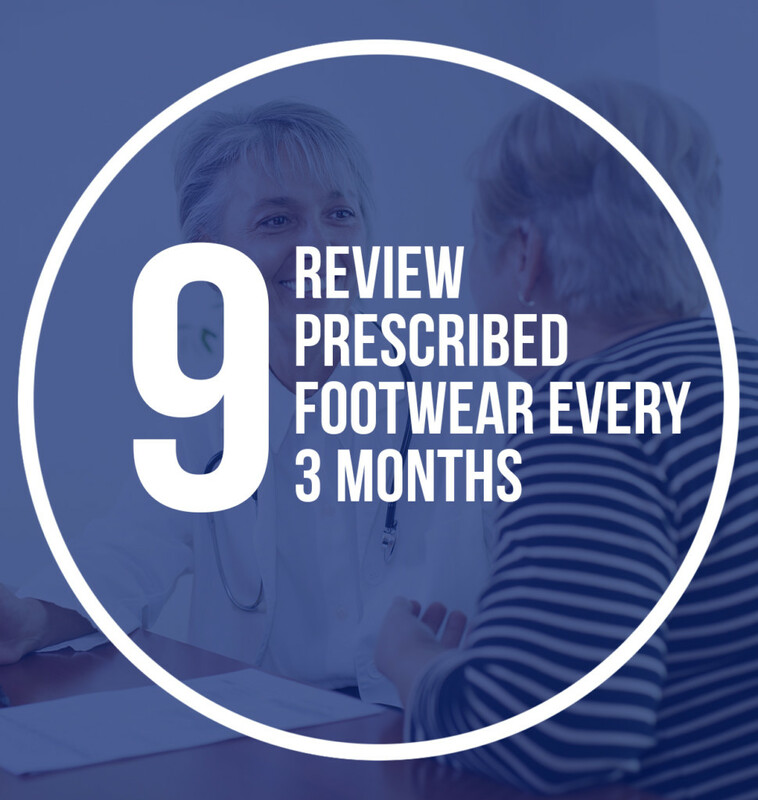 Prescribed footwear, and custom-made orthoses or insoles, should be reviewed every three months to ensure it still fits, protects and supports the foot. Footwear is not specifically recommended to treat a plantar diabetic foot ulcer in the IWGDF guidelines; in contrast offloading devices are recommended and necessary to heal these ulcers. 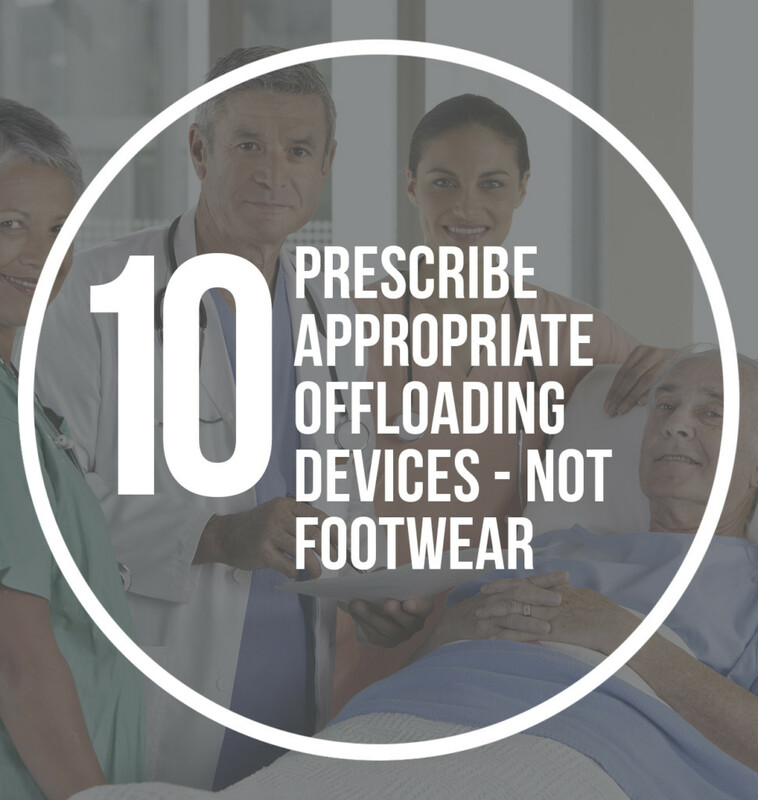 We strongly recommend that any health professional treating a patient with a plantar diabetic foot ulcer ensures their patient has an appropriate offloading device. Each patient with a diabetic foot ulcer deserves optimal evidence-based treatment. 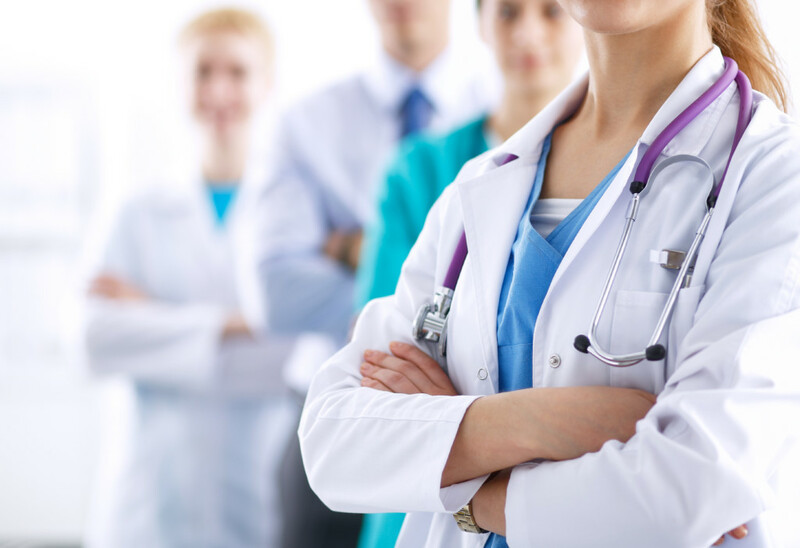 Australian and international guidelines are available to direct evidence-based clinical practice in Australia. Diabetic Foot Australia supports for access to this information. As part of our “DFA Guides You Through” series, we guide you through Australian and International Guidelines. We have summarized the Australian and international guidelines, and discussed the most important differences. Rather than sitting down and having to read both guidelines in full, we've broken this down into six handy parts below. Australian and International guidelines - where to go from here? The below nine goals are formulated within these priorities, each with their potential areas for action and measures to keep track of their progress. We look forward to the uptake of this strategy, and monitoring the positive steps the Australian DFD community will take on the pathway towards ending avoidable amputations in a generation. All people at-risk of diabetes-related foot disease should have access to preventative evidence-based healthcare from appropriately trained health professionals. All people with diabetes-related foot disease should have access to evidence-based healthcare from specialised interdisciplinary foot disease services. All health professionals and specialised interdisciplinary foot disease services caring for people with, or at-risk of, diabetes-related foot disease should demonstrate they meet minimum Australian evidence-based standards. All health service regions should report their diabetes-related foot disease outcomes annually to monitor progress towards ending avoidable amputations. 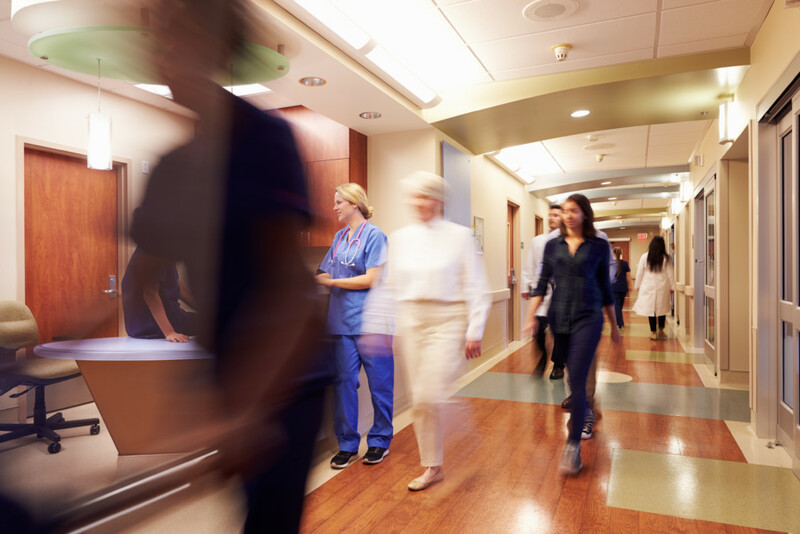 Australian national diabetes-related foot disease guidelines should continually reflect the most up-to-date robust evidence to guide standards for healthcare provision and outcome reporting. An “Australian Research Agenda for Diabetes-Related Foot Disease” should be developed and endorsed to guide national research priorities. An “Australian Diabetes-Related Foot Disease Clinical Trials Network” should be established to provide national research support and leadership.